Looking at a snapshot of Portugal today, it somehow feels quintessentially vintage. As the iconic trams climb steep, inner-city slopes, multi-hued laundry flutters from windows, and the cobblestone streets tell stories from yesteryear. And while each city oozes old-world charm, there’s an undeniable vibrancy that continues to attract tech innovators, adventure-seekers, and foodies from all over the world. The beauty of the country needs no introduction, but once you look a bit deeper, you’ll find that mild climate, affordable rent, and the promise of a high standard of living creates an enchanting combination for digital nomads looking for cohesion in the place they call home. As location independent professionals work to find their groove, coworking spaces have become hubs for a new kind of culture. To put it simply, the days of stiff, copy & paste office spaces are done. Now, members expect a more personalized experience where they can easily collaborate in a flexible space that allows them to work according to their rhythm. With a free flow of energy and ideas, these coworking spaces are rising above the traditional office setting which doesn’t offer much more than a desk, internet connection, and coffee. 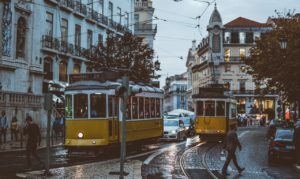 If you’re a digital nomad who has your sights set on Portugal but are still looking for a dedicated place to dive into work, you’ll want to take note of these unique coworking spaces. At Portio i/o, the coworking spaces are merely vessels for the company’s core values—people. Working with Porto families to refurbish historic buildings while turning them into lively spaces is just one way Porto i/o keeps their passion for connection front of mind. By harnessing a community of diverse professionals, Porto i/o attracts local and international companies with coworking spaces that help spark innovation and inspiration. If the stunning views from their penthouse office space don’t get you, their eclectic event calendar and warm take on relationships will. As a digital nomad, it’s hard to find a life away from your laptop, but with a built-in community, it becomes a lot easier. Drop your surfboard at the door, find a spot underneath the neon-lined pop culture clippings that decorate the room, and dig into your daily grind. Not a bad way to start the workday, right? With an unbeatable location next to the beach, this newly developed space was designed with collaboration in mind. Inviting, bright, and quirky, JavaCowork encourages professionals to connect…and it works! People enter JavaCowork as freelancers and leave as business co-creators. With their personal training services and partnership with Umbigo Feliz, an on-the-go, fresh and healthy food spot, JavaCowork understands that wellness is the key to success at work. GoGo Places is spreading across the globe, and now we’re looking for a Country Representative in Portugal! Community is at the center of everything we do. That’s why we’re looking for a self-motivated professional who can identify new markets, build relationships with homeowners, and act as a liaison for the GoGo Places brand. If this is the year you explore new opportunities, we’d love to hear from you! For more information click here. At Fusion Cowork, it’s the people that set this coworking space apart. Here, the team understands that cohesion with the community starts far beyond their front doors, and they work to assist professionals with whatever they might need—regardless of whether it has anything to do with coworking. Fusion Cowork is a clean, concise space brimming with a team of ‘nice, regular human beings,’ as Collaboration Mastermind, Hugo Cavaleiro, puts so simply. And they don’t take themselves too seriously, to boot! For companies, small businesses, and freelancers who need a home away from home, Fusion Cowork offers varying tech talks, a fully equipped office space, and an intersection of work, life, and connection. The best way to build a community is to become part of it, and that’s precisely what the folks at No Office Work (NOW) believe in! Founded nearly ten years ago, NOW was one of the first coworking spaces in the country—helping to change the idea of what ‘work’ should feel like…and their vision spread quickly! Whether you’re keen on developing new projects in an old wine warehouse or would prefer a more traditional spot in the heart of the city, NOW has three unique locations, so you can choose the space that aligns with your style! Founders, Ana and Fernando, set the tone by treating coworkers like family. It’s an act that seems so simple, yet it helps to bridge the gap for professional drifters looking to connect offline. NOW offers exactly what you would expect from a coworking space with such a huge reputation, an engaging atmosphere, large auditoriums, central locations, and a multifaceted community of professionals. Are you a marketing professional who can develop campaigns, drive conversions, and create media opportunities for GoGo Places? Our team is looking for a talented digital marketer! Click here for more information. We can’t wait to hear from you. With two locations in the heart of Lisbon, Cowork Central has created a cozy space with views that will make you forget you’re sitting behind your laptop. Remote work can feel isolating. Anyone who has worked from home for long periods of time knows that sometimes, you just need a reason to get out of the house. This shared space allows newcomers and locals to come together in a flexible environment designed with every professional in mind. Whether you’re a freelancer or have a large team that needs a collaborative space, you’ll find it here. The Village Underground has quickly become a staple in the Lisbon cityscape. By upcycling double-decker buses and shipping containers, this coworking space reimagines the idea of what an office should be. The zany architecture transcends into the culture of this coworking space. And if you’re a creative looking for a bit of a different pace, you’ll probably find it at the Village Underground. This imaginative hub is no stranger to music events, vivacious meetups, and talented individuals looking for a place to hone in on their art. White walls, clean lines, and natural materials greet you as you find your own comfy corner in Atelier. This simple, honest to goodness space has everything you need for a focused work day. Atelier is positioned in downtown Faro, steps away from quaint cafes, restaurants, and the Alagoa garden. If all you need for a focused work day is your laptop, serene ambiance, and fast wifi, Atelier is an easy choice. As a digital nomad, you have the entire world at your fingertips! So if you’re looking for one destination where you can surf, sip caipirinhas in the sand, and take quick weekend trips to a variety of European destinations, Portugal should be a no-brainer. When it comes time to find accommodations for your stay, we have you covered! Whether you want to stay a month or an entire season, we have flexible living options for the digital nomad in you. Check out our current listings here!